Bend Oregon Real Estate Broker - Jim graduated from Portland State University in 1976 with a Degree in Business Administration. He also received his real estate license that year. When Mt. Saint Helens erupted in 1980 he decided to move his family to Bend Oregon and specialize in the sale of quality homes. 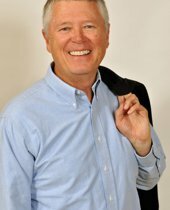 Jim has been one of the top Brokers in Bend and Central Oregon for over 30 years! In 2004 he brought his son Matt into the real estate business with him. Matt takes care of Jim's clients when he's out of town. Jim knows the community well. His children both have gone thru the education system in Bend including graduating from Central Oregon Community College. Jim’s daughter is a Registered Nurse at Saint Charles Medical Center. Jim and his wife Connie enjoy fishing, bird watching, biking, tennis, hiking, skiing and most outdoor activities. Jim is a Realtor, Designated Broker and CRS. Certified Residential Specialist (CRS) is the highest Designation awarded to Brokers in the residential sales field. The CRS Designation recognizes professional accomplishments in both experience and education. If you are buying or selling real estate in Bend Oregon Jim is the best qualified to help you with your transaction from negotiating the best price, writing the contract in your best interest, home inspections, appraisals, closing dates and possession dates. His real estate knowledge, experience and professionalism are what you need to make your move an easy one. Real estate in Bend and Central Oregon is a great investment. Call Jim today for a free consultation with no obligation. Jim Johnson sold us our house in the Mountain High neighborhood. He did a great job, making the whole process pleasant. He and his wife have since become good friends. It turns out they like to take trips in their RV, as do we, so we exchange travel stories. Jim is extremely knowledgeable about the ins and outs of real estate in the greater Bend area and always has an informed answer to every question we've had about it. When our sweet 78 year old next door neighbor moved last year, Jim represented the new buyers, a delightful couple from Colorado. That too went smoothly and pleasantly. What we especially like about Jim, and what attracted us to him in the first place, is that he and his son run their own small business. They are not part of a large corporate firm. This gives them the flexibility to take their time with people and be friendly. Jim helped us find our home with amazing speed and assistance. He's a great broker and I appreciate the great website and powerful search engine we had to search for homes in Central Oregon.